Very limited production of 1000 bottles. 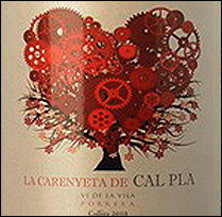 100% Carenyena, as known locally, is a single-variety Carignan from a tiny plot from Finca Els Arbres, of low-yielding 70-80- year-old vines planted on hillsides 300-500 metres above sea-level, on slate ‘licorella’ soils cultivated by hand. La Carenyeta is aged 14 months in French oak. A great expressive, concentrated, fleshy, ripe black fruit-laden Priorat with spicy touches, cinnamon, liquorice, nutmeg, balsamic notes, aromatic herbs, sweet ripe tannins and a strong mineral character.